Romanesque style to the initial design by Architect Richard A. Waite. In1909 after a disasterous fire, a significant rebuild and addition to the westwas made to the design of Architect E. J. Lennox, and concurrently a new library was constructed to the north to the design of George W. Guinlock. Preparation of an investigation Report and Measured Drawings of the East Wing Skylight, in order to correct water leakage problems and restore the skylight to its former design. A detailed on-site investigation was carried out, during which a section of the skylight was disassembled down to the roof deck-level air-barrier membrane. An ensuing report and record drawings provided the client with detailed background, statement of problem and Summary and Conclusion with Design Options. 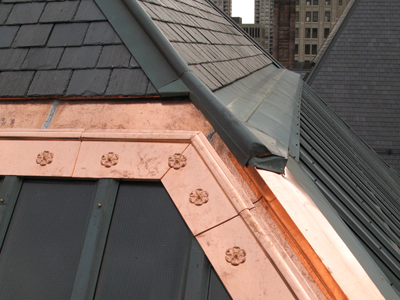 A Pilot Restoration project was selected where one of the four sides of the pyramidal skylight was disassembled, repaired and upgraded to contemporary weather shielding standards, while re-incorporating Richard A. Waite's original design details such as the concealed gutter. A subsequent full skylight repair project was carried out in 2014 which incorporated scaffolding from an adjacent masonry repair project to significantly reduce costs. 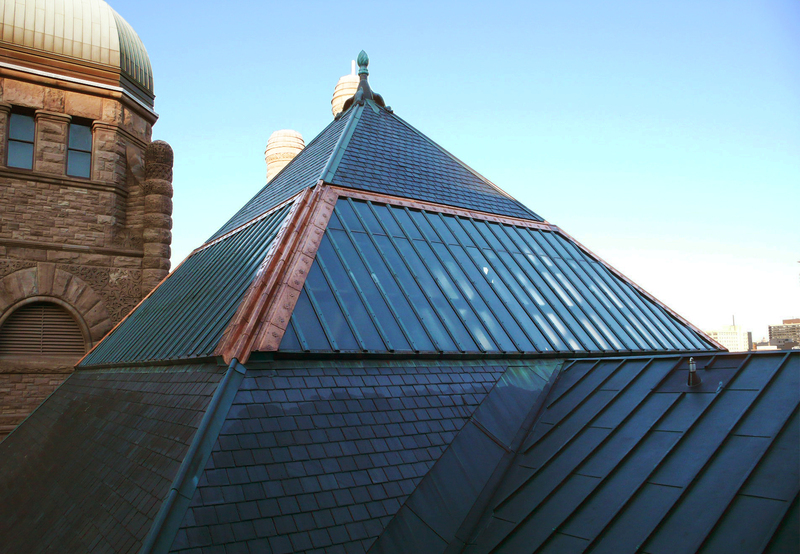 Construction was carried out in accordance with to highest quality thermal and glazing standards for skylights, and best traditional copper restoration practice incorporating elements of the original skylight.